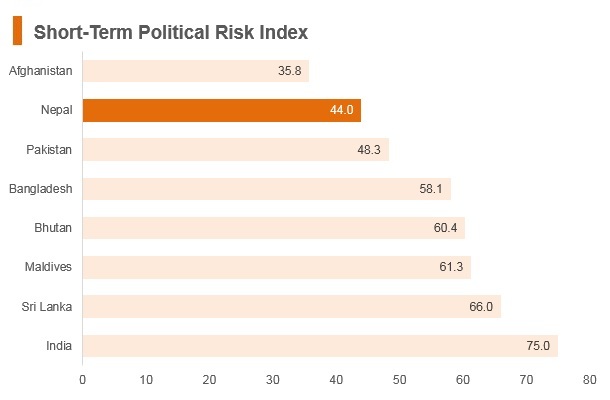 After years of transition, Nepal is headed for political stability following local, provincial and federal elections in 2017. 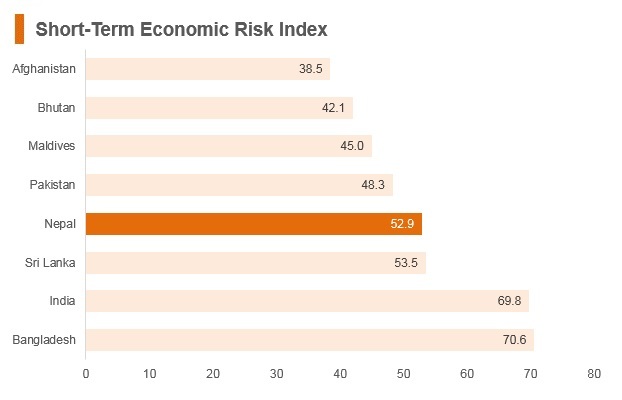 Although economic activity rebounded strongly in Nepal in 2017, the country still faces increasing domestic and external risks. Pushpa Kamal Dahal replaced as Prime Minister by the Congress leader Sher Bahadur Deuba under a rotation agreement reached the previous April and set to last until elections in February 2018. The new cycle of legislative elections came to an end with the February 7 indirect election of the National Assembly. The names of members elected under the Proportional Representation system to the seven provincial assemblies were announced on January 17 and to the House of Representatives on February 14, 2018. The main group of Nepal’s Maoist former rebels and the Communist UML party merged on May 17 to form Nepal's biggest left party. Officials said the two constituents of the ruling coalition had formed the Nepal Communist Party, which now heads the nation’s first majority government in 19 years. Nepal joined the WTO in April 2004 as its 147th member. The World Bank 2018 Ease of Doing Business Report ranks Nepal 76th out of 190 countries in the trading across borders index. 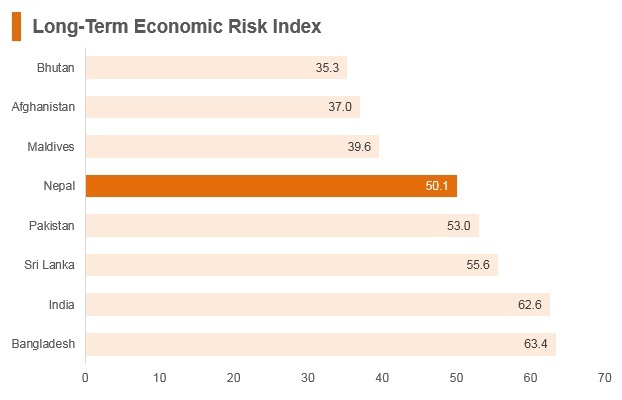 In the latest World Economic Forum (WEF) Enabling Trade Index (2016) which measures institutions, policies and services to facilitate trade in countries, Nepal was ranked 108th out of 136 countries. Nepal benefits from the Generalized System of Preferences (GSP), but it does not participate in the Global System of Trade Preferences (GSTP) among developing states. 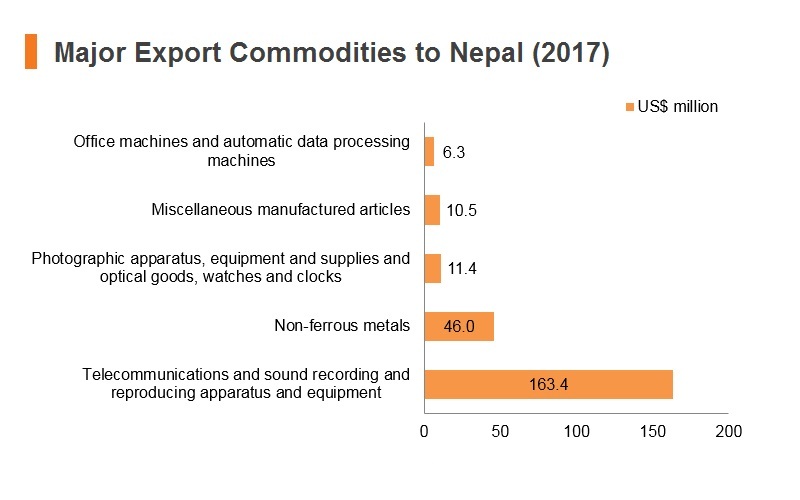 Nepal's average tariff rate, at 10.9%, is the second highest in the South Asia region (out of eight countries), with weapons and automobiles being subject to the highest applied Most Favoured Nation (MFN) tariff. Cement faces an unbound tariff in order to develop the domestic industry, as Nepalese consumption of cement is mostly met by domestic production. 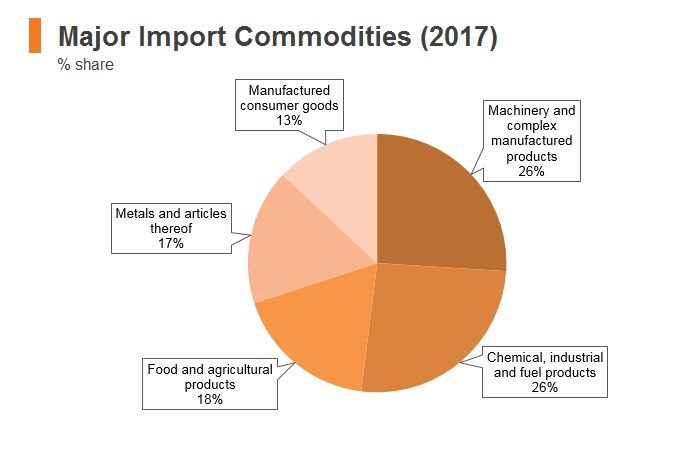 Tariff escalation on certain products, including paper printing and publishing, textiles and leather, and chemicals, exists between first stage processing, semi-processed, and fully processed products. However, these tariffs aim to collect revenue rather than protect the processing or manufacturing industry. 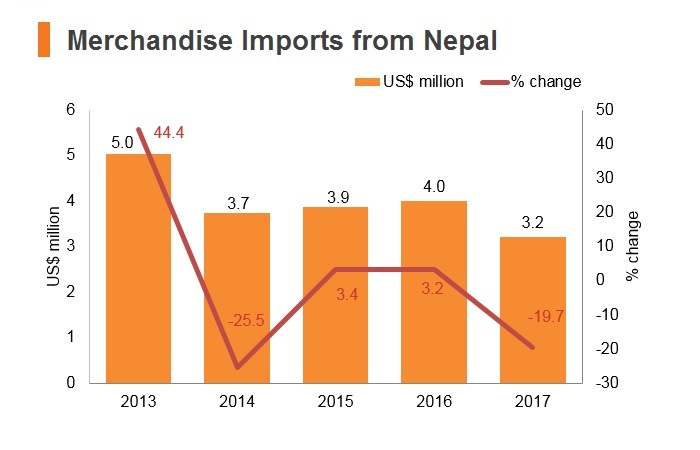 Nepal does not allow the import of used items, the definition of which is often interpreted to include refurbished products (with the exception of refurbished aircrafts). 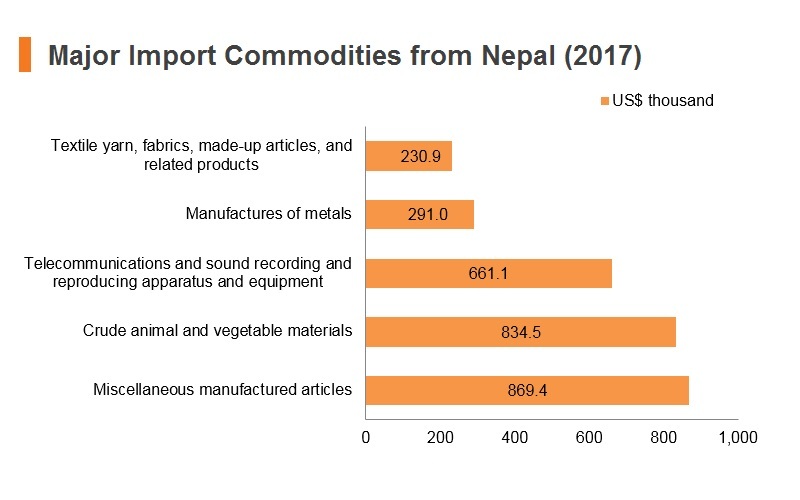 Import duty rates in Nepal vary from 0% to 80%. 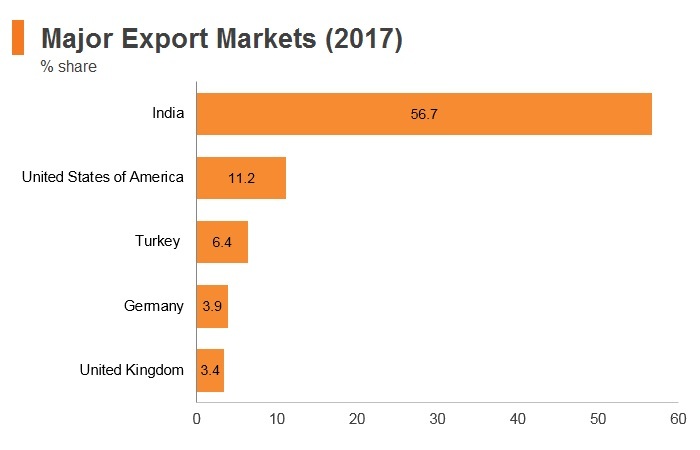 Live animals, fish, and most primary products are exempt from import duties if imported from India, while a duty of 10% is applied on imports of these items from countries other than India. Infrastructure of standardisation and conformity assessment in Nepal is not sufficient as the country lacks an accreditation system and testing facilities. 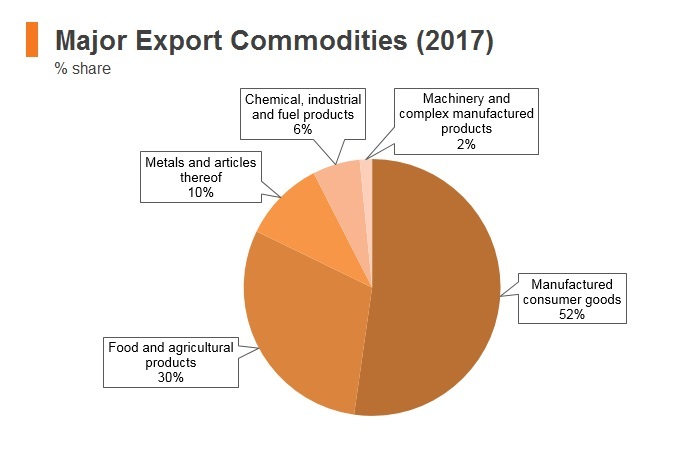 This makes it difficult for Nepalese exporters to compete in global markets due to, for example, exports of food, plant products, animal products, and agricultural products requiring sanitary and phytosanitary certificates issued by the Ministry of Agriculture and Cooperatives. In June 2018, Nepal and China signed memorandums of understanding (MoUs) on various projects that fall under the framework of the Belt and Road initiative, as well as on matters pertaining to trade and economic cooperation at an event held at the Nepali Embassy in Beijing. The South Asian Preferential Trade Agreement (SAPTA): This agreement was originally signed in 1993; however, the scope of SAPTA was limited, therefore, it was expanded to the South Asian Free Trade Agreement (SAFTA), which is a plurilateral Free Trade Agreement between Nepal, Bhutan, Afghanistan, Bangladesh, India, Maldives, Pakistan and Sri Lanka. The agreement covers trade in goods and entered into force in January 2006; Afghanistan later joined in August 2011. Nepal-India Partial Scope Agreement: The bilateral Partial Scope Agreement between Nepal and India covers trade in goods and entered into force in October 2009. 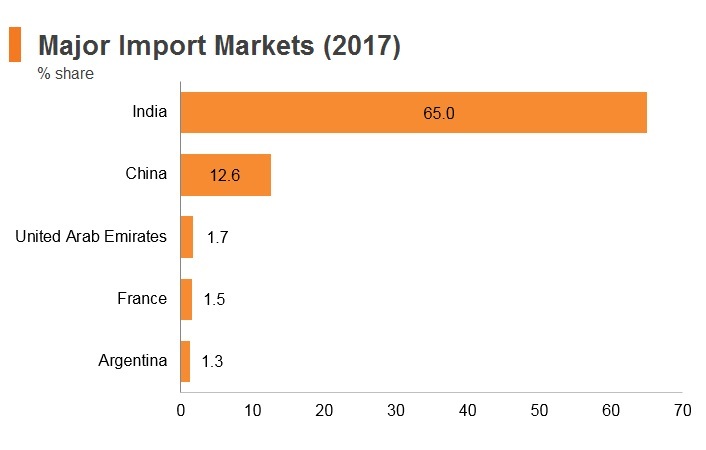 India is Nepal's largest import source, and as of 2017, Nepal imported 65.7% of its total imports from India, of which minerals, mineral fuels, mineral oils and products of their distillation, as well as bituminous substances, made up the highest percentage. The Bay of Bengal Initiative on Multi-Sectoral Technical and Economic Cooperation (BIMSTEC): A plurilateral Free Trade Agreement that is currently under negotiation. The agreement will focus on the trading of goods between Nepal, Bhutan, Myanmar, Sri Lanka, Bangladesh, India and Thailand. The bloc will bring together 1.5 billion people, or 21% of the world's population, and will have a combined GDP of over USD2.85 trillion. Invest Nepal is the country's information source and agency that is tasked with investment promotion and business facilitation. The entity aims to serve as a single reference point for sector-specific information for both foreign and local investors. 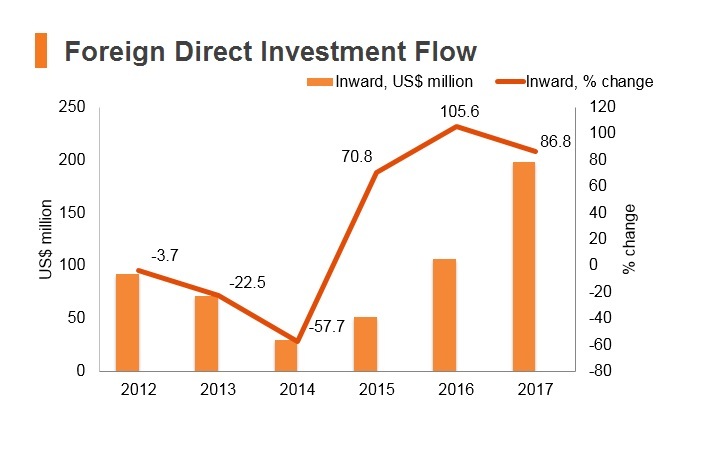 In February 2015, the government of Nepal issued the Foreign Investment and One-Window Policy 2015, which replaced the Foreign Investment Policy of 1992. The new policy outlines priority sectors for foreign investment, which include hydropower, transportation infrastructure, agro-based and herbal processing industries, tourism, and mines and manufacturing industries. The Foreign Investment and One Window Policy also establishes currency repatriation guidelines, outlines visa regulations and arbitration guidelines, allows full foreign ownership in most sectors, and creates a ‘one window committee’ for foreign investors. 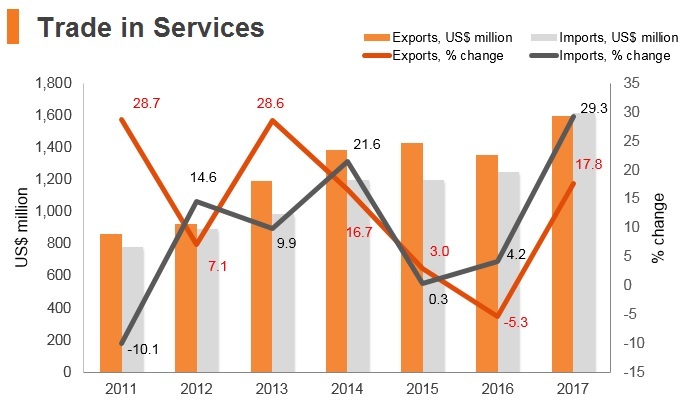 The Foreign Investment and One Window Policy opened the retail sector to foreign investment for the first time; however, there are some conditions. Foreign multi-brand retail stores (such as Walmart or Tesco) are now permitted, provided the investor has operations in more than two countries and invests more than USD5 million in fixed capital. The policy also states that foreign investors will be treated the same as local investors, and industries run by foreign investors cannot be nationalised. The new policy is also aimed at simplifying visa policies for investors, family members, and assisting foreign investors with land acquisition, industrial security, and repatriation of investment and profits. Foreign and domestic private entities are allowed to establish and own business enterprises and engage in various forms of profit-generating activities. 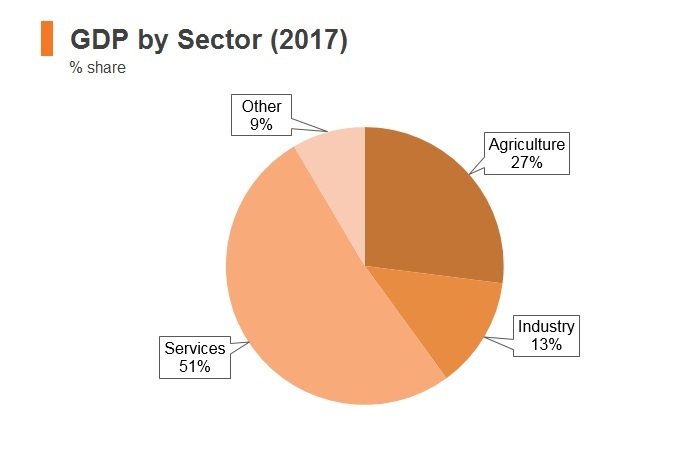 However, the Foreign Investment and Technology Transfer Act (FITTA) of 1992 restricts certain sectors from foreign investment, including small-scale and ‘traditional’ industries (such as handicrafts, wood carvings, and artwork), real estate, certain types of primary agriculture and agribusiness, and weapons production. 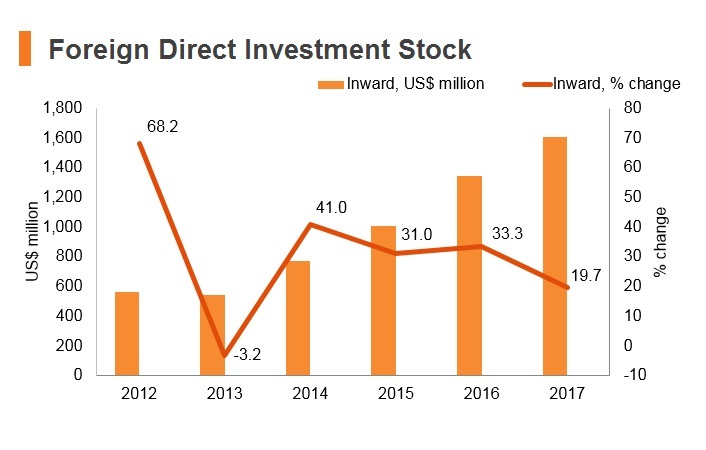 The Foreign Investment Policy of 2015 lowered the number of restricted sectors, but these changes will not be implemented until Parliament approves the draft Foreign Investment bill. Approval and registration requirements vary depending on the sector in which a foreign entity intends to invest in. 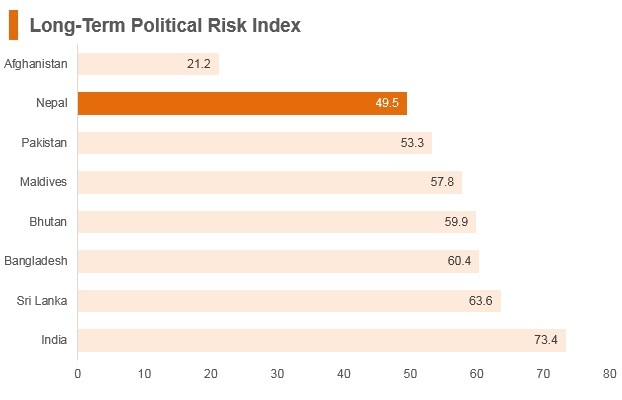 Other than the restricted sectors mentioned above, 100% foreign investment is allowed in most sectors. Some limits on foreign ownership are imposed for certain services sectors, such as banking and financial institutions, where foreign investment is only permitted through joint venture, with a minimum of 20% and a maximum of 85% foreign ownership. Branch operations of a foreign bank are only permitted in the wholesale banking sector, not in the retail banking sector. 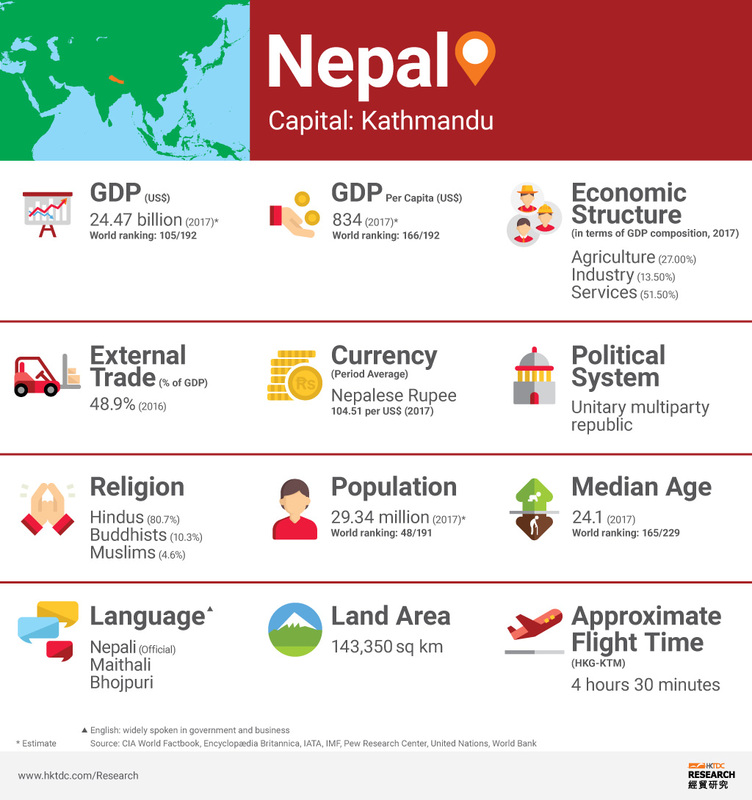 The minimum capital requirement is USD20 million to operate a branch office of a foreign bank in Nepal, and an additional USD5 million is required for each new branch office. 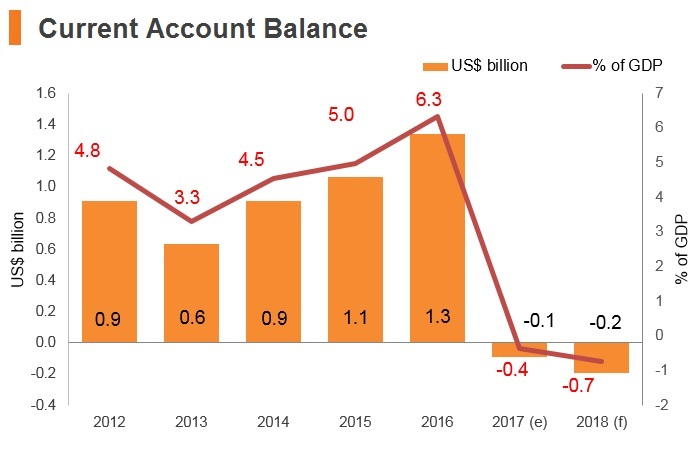 Restrictions on branch operations of foreign banks in the retail banking sector and requirements for mandatory domestic joint venture partnerships have discouraged many international banks from entering Nepal’s banking sector. The Nepal Stock Exchange does not allow foreign investors to own or trade any publicly traded companies on the exchange. Stock trading is only permitted to citizens of Nepal. The government of Nepal is developing the country’s first Special Economic Zone (SEZ) in Bhairahawa in southern Nepal, near the border with India. The government eventually plans to have up to 15 SEZs throughout Nepal. 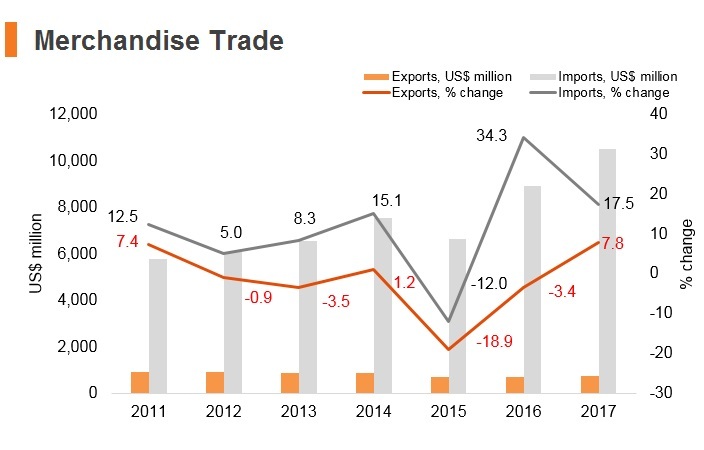 In August 2016, Nepal’s Parliament approved the SEZ Act, which provides numerous incentives for investors in SEZs, including exemptions on customs duties for raw materials, streamlined registration processes and guaranteed access to electricity. The act also bans labour strikes in SEZs. General incentives Businesses that invest in exporting industries are given investment incentives, as are those who invest into certain ‘priority’ industries, such as tourism, civil aviation, and hydropower. There is no discrimination against foreign investors with respect to export/import policies or non-tariff barriers. The government of Nepal offers tax incentives to encourage industries to locate outside the Kathmandu Valley. Resident natural persons are taxed on all income from worldwide sources. Non-resident persons are taxed on Nepal-sourced income only. There are no formal localisation policies in Nepal, but many foreign businesses and foreign workers have complained about the difficult process for obtaining work visas. The government of Nepal generally limits the number of expatriate employees permitted to work at a company. Citizens of India do not need a visa to enter Nepal and are granted Freedom of Movement. Most other passports are granted visa on arrival given that a fee is paid. 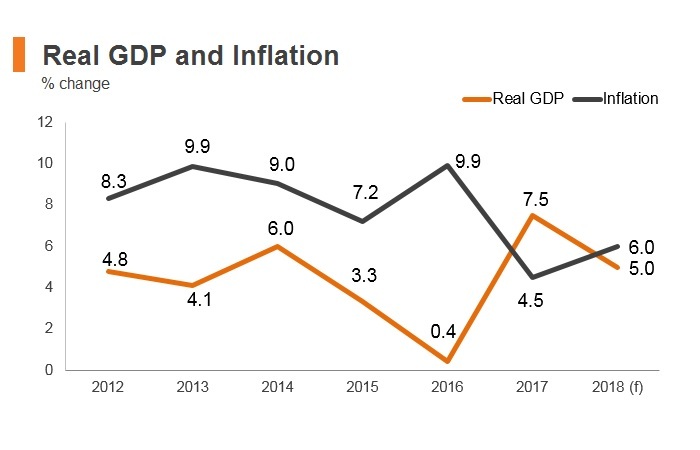 Nepal saw a broad-based recovery in 2017 as economic activity picked up, inflation moderated, government revenue and spending rose and remittances grew. That said, growth is expected to be below potential in 2018 in light of the worst flooding in decades. 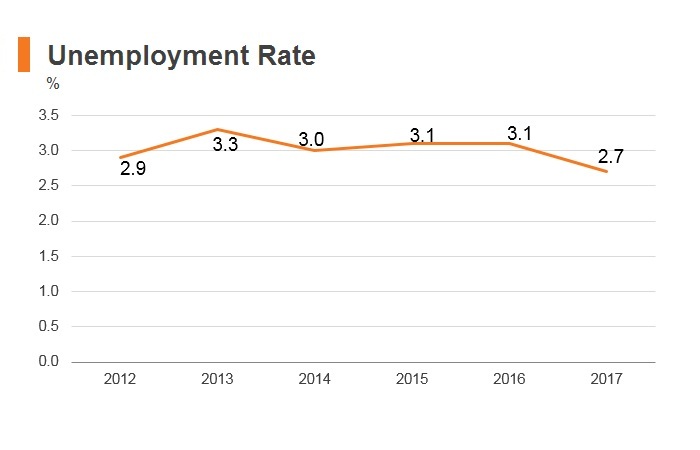 Slow recovery of exports, increase in lending rates, and a dynamic political environment will continue to pose challenges. Nepal is transitioning into a federal democratic state, where it completed its first local elections in 20 years, which took place in three phases. Provincial and parliamentary elections were completed in December 2017. That said, significant adjustments need to be made to the government structure. 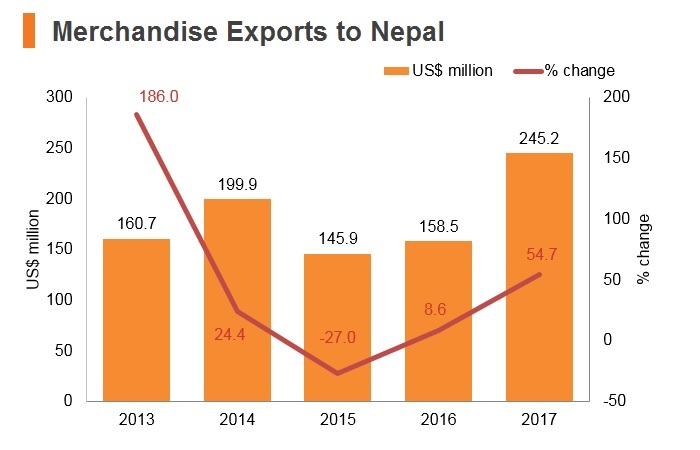 Businesses in Nepal are challenged by risks of extreme weather conditions, such as the flooding in mid-August 2017, the third major shock in three years, which caused severe disruption and damage to existing supply chains, especially through the southern plains. HKSAR passport holders receive a visa-on-arrival in Nepal for which the duration of stay is to be determined by the authorities upon arrival.